Whether you want to stroll for seashells, ride waves, or build sand castles, there are amazing beaches worldwide and all of them can make a favorite coastal playground. The beaches can come in all shades of brown, beige, green, pink, and even black sand. You can find from a very fine sand to a gravel type of sand. It is a wonderful destination for kids of all ages, young and old! There's magic in those waves that keeps bringing people back for vacations year after year. A calm, peaceful feeling. Eight Islands and many small cays make up the Turk & Caicos Islands, of which Providenciales (Provo) is the most developed and renowned for its pristine, white sand beaches. The Turks and Caicos are also home to the world’s third-largest barrier reef, after Australia’s Great Barrier Reef and the Belize Barrier Reef. This translates to miles and miles of swimmable water until the breaker—when the depth suddenly drops to 7,000 feet. The main island, Providenciales (nicknamed Provo), is incredibly family-friendly. The waters are manageable for all types of swimmers, and the five-star hotels that line the beach provide every amenity possible. In many ways, being on the island feels like going back to a simpler time. Aloha to the beautiful islands of Hawaii - plus no passport needed! As you step off your flight, breathe deep and smell the fresh plumeria in the air! Don’t be surprised if your romantic vacation, honeymoon or family vacation to Hawaii becomes your favorite destination ever! Each island has its own distinct personality and offers its own adventures, activities and sights. You will find palm-fringed blue lagoons, lush rainforests, hidden gardens, cascading waterfalls, soaring volcanos. And, don’t forget about the beaches…they come in a variety of colors-gold, red, black and even green sands caressed by endless surf. There are 6 fabulous main islands and each are so very different. In a 10-day to 2 week vacation you will find yourself deciding which 2 islands are best for you. Don’t forget to throw your lei in the ocean prior to leaving and the saying is, if it comes back to you, you will surely find your way back for more adventure. This is truly a wonderful vacation for families, multigenerational, honeymooners, and romance travelers. Really, do you need a reason to visit the islands of Hawaii? Tahiti is the ultimate destination for a honeymoon, anniversary or a romantic escape. Sunbathe on powder white beaches as you look across the lagoon to the emerald mountains. Spend your nights in an over-water bungalow fitted with Plexiglas screen that allows you to observe the fish in the waters below. Imagine enjoying a delicious breakfast delivered by canoe. Take a romantic day cruise through the islands of Tahiti, Moorea, Bora Bora, Huahine or Taha'a or have a gourmet picnic in the quiet seclusion of a Motu — your own private islet. Come visit these laid back, unspoiled Garden of Eden; the type of magical place that perhaps you thought had disappeared. Some other unspoiled, untouched South Pacific Islands to visit comprised of Fiji, Tonga, Samoa and the Cook Islands. Explore ancient Mayan civilizations. Swim with whale sharks and stingrays. Dive in a large coral reef, zip-line above tree tops. Bet you didn’t know you can ride a camel in the desert! This is Mexico where epic experiences are part of your everyday and everyday offers you amazing discoveries. In Los Cabos, Deep Sea Fishing is a favorite for many. Many hotels even have programs where you can cook up your catch at your hotel for dinner. Don’t forget to visit the famous Cabo Wabo Cantina where you may even catch a glimpse of a celebrity. Here you will find many ocean-front, high-end resorts and world class golf. Down south you will find Cancun surrounded on 3 sides by a lagoon, bay and the turquoise Caribbean Sea. A fun-lovers paradise for all ages, adventure seekers, eco-tourists and history buffs. With 14 miles of pristine white sand, watersports and beachside relaxation are a must. Here you will find the Great Maya Reef, the largest coral reef in the Northern Hemisphere that brings out the diver, snorkeler and fisherman in all of us. This is where you will find the gateway to the Mayan world, the ruins of Chichen Itza, Tulum and Coba which lie in the jungles. Some of the best All-Inclusive Resorts for Adults-Only Families and everyone! The Caribbean is where the emerald rainforests and tropical gardens burst in showers of vibrant color, and palm trees sway to the beat of reggae. Where the island sun warms your soul and the smiles of the people melt your heart. Where romance comes alive, and children live in the moment. Get lost on sugar-white sands, and find yourself. Maybe you prefer a charming resort where one price covers everything - luxurious rooms or suites, exclusive amenities, and the most spectacular views the Caribbean has to offer. In the Caribbean you will find so many island experiences from climbing cascading waterfalls, tubing, kayaking, and swimming with the stingrays or Zip-lining. Costa Rica remains a destination rich in natural wonders, where you can still find yourself away from crowds. You will find stretch of beaches, small lodgings or a few All-Inclusives that cater to all kinds of families and adults. Depending on the region of Costa Rica you choose to visit, will determine the landscape you’ll become familiar with. 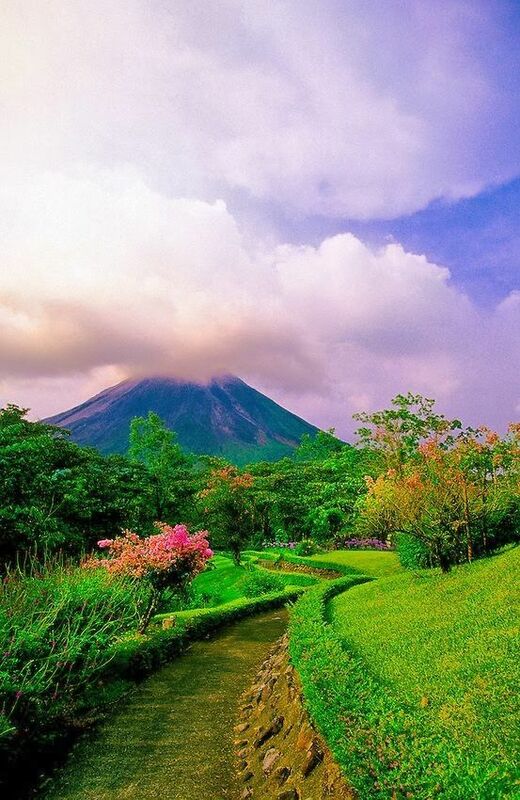 For those interested in long, scenic hikes, should head to La Fortuna’s Arenal Volcano or Montverde’s Cloud Forest. Nearly all of Costa Rica’s northern territory is national park, allowing thousands of species of birds, mammals, and reptiles to thrive. Travelers looking for a beach getaway should head to the Northwest Pacific region, where Costa Rica’s Guanacaste can be found. Equipped with white-sand, black-sand, and secluded beaches, Guanacaste is home to some of the most breathtaking beaches in Central America. If you’re looking for a traditional adventure, you’d best head to the Central Pacific region and discover what Manuel Antonio and Jaco have to offer. Manuel Antonio boasts hundreds of species of wildlife in the national park as well as gorgeous palm studded beaches. Jaco has one of the rowdiest nightlife’s in all of Costa Rica, but surfers looking for Hawaiian-sized waves should head 10 minutes south to Playa Hermosa. Clearly, Costa Rica offers an experience that caters to all types of preferences. Whether that be a beach getaway in Tamarindo or a biological adventure in Manuel Antonio, we guarantee that your vacation will something you remember for the rest of your life!